The origin of the Penny Boards is due to the brand Penny Australia. Also they still produce – probably – the best Penny Boards and ship them worldwide. However, the original Penny Australia Boards unfortunately are quite expensive. There are a lot of alternative brands offering cheaper Penny Boards in a decent quality. Who puts value on fancy designs and the best quality out there and also is willing to spend a little more money, should take a look the Penny Boards of Penny Australia! Penny Australia offers many beautiful designs, some are more simple, while others are very extraordinary. Of course, the brand is well known and is considered to be the best one. I can fully recommend the Penny Boards of Penny Australia to anyone. They are simply the best (but not the cheapest) cruiser skateboards. Those who put more value on the value for money, I recommend to a Penny Board of the brand Ridge. You get there for about $60 the Penny Board 22″ or for about $63 the 27″ Nickel Board! The quality of the cruiser skateboards of Ridge is (almost) identical to that of the original boards from Penny Australia, but the boards cost only a third. There are not as fancy designs, but there are many different colors and combinations with colored wheels to choose from. In my opinion the Penny Boards by Ridge are the best choice. If you want a review of the Penny Boards by Ridge, check out the article “Ridge Penny Board review“. There are lot of brands offering even cheaper Penny Boards than Ridge does. 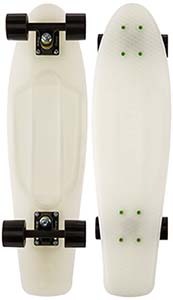 You may get a Penny Board 22″ for about $35 to $40. These Penny Boards are usually not as well-made as those of Penny Australia or Ridge, but they are still good and have a good value for money, as well. But you have to be careful, there are many Penny Boards which cost less than $40 and are completly rubbish. If the Penny Boards of Ridge or Penny Australia are too expensive for you, then I recommend you to buy either a Penny Board of Sun Boards, EightBit or Boss Board. These three brands offer very cheap Penny Board with reasonable quality, so you don’t waste your money! There you’ll get good and cheap cruiser skateboards.